The new and improved Pioneer features a chrome or lightly textured matte silver chassis with stylish chrome highlights that complement the premium Oxford woven marl fabrics in the new new colours. 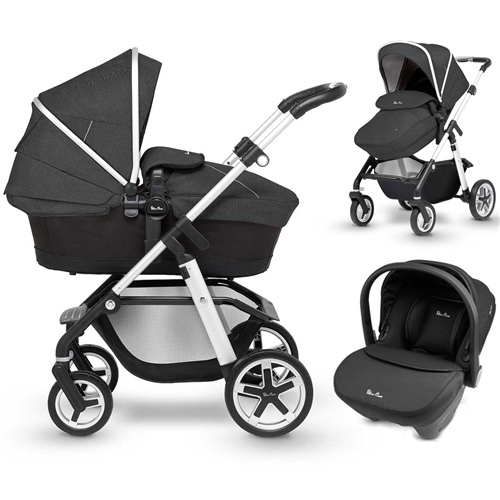 Pioneer is perfect for off-road adventures, giving you and your baby the freedom to roam with a tough suspension and large, multi-terrain wheels. The new wheel design has never-wear, puncture-proof tyres for longevity and performance. The carrycot provides a comfortable environment for newborns and is also perfect for overnight sleeping. The reversible pushchair seat unit provides a roomy seat for fast-growing children and is suitable for up to 25kg. Choose between parent facing or forward facing. Adding award-winning Simplicity car seat and the Pioneer becomes a complete travel system. You’ll be able to tackle any situation, be that around the busy city streets or through country parks, knotted woodland or by the seaside. Pioneer is truly ready for anything! Simplicity is a rear facing car seat that can be installed with either a seatbelt or the specially designed Simplifix Isofix base. The optional base has indicators that show green when Simplicity is correctly installed, preventing the common problem of incorrectly fitted car seats. Simplicity features a five point safety harness for a secure and comfortable fit. The harness is connected to the head support and both can be adjusted with one hand while the baby is in the seat for greater convenience. The head support also offers maximum side impact protection for your baby. The Simplicity car seat also includes a retractable hood and a cosytoes apron that will keep your baby warm when in the car seat. Together these innovations make the Simplicity a ground-breaking car seat, making it much easier to keep your little one safe and sound. Simple, really. Everything arrived on time and was so well packed. I and the family were very impressed. It's a while until I use it but i cannot wait. They have extra padding in which is brilliant too. Love it. I am so so happy with my purchase. The ordering process was straight forward, the delivery was quick and in comparison to other retailers such a saving.